Junior world championship representative Stephanie McKenzie proved she has a bright future after a superb performance on the opening night of the RaboDirect National Age Group Cycling Championships in Invercargill tonight. McKenzie disposed of her rival Paige Patterson (Auckland) in a closely fought 2-0 battle in the under 19 women’s sprint. Southland's Kate Dunlevey claimed bronze. Earlier McKenzie smashed the New Zealand record of 11.436sd and posted the fastest qualifying time. “I’m really happy with how things went today. I wanted to do an 11.5 in qualifying so was over the moon when I did a 11.46,” McKenzie said. McKenzie, second in the team sprint at the junior world championships last year, is targeting the championships this year in Moscow where she hopes to break the 200m world record. McKenzie was just 17 years when she made the move to Invercargill earlier this year. BikeNZ has already expressed confidence in McKenzie, selecting her to race at the elite Melbourne Track World Cup last year. “The sprint girls are about a year behind the boys in terms of results and development. We hope that we can lift our game so that will look at us for selection for London,” she said. 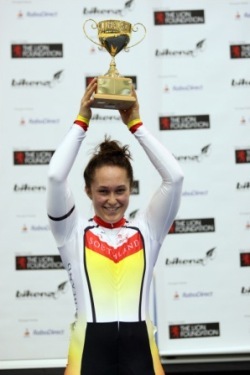 McKenzie was awarded the BikeNZ junior track rider of the year trophy for her stunning 2010 season. The Under 19 Mens title was won in similar convincving fashion by Canterbury's Dylan Kennett. The under 19 Auckland trio of Raquel Sheath, Georgia Williams and Georgina Wilson set a new national record in the under 19 women’s team pursuit while riding to silver in the open women’s category. It was an all Southland final in the open men’s 4000m team pursuit. BikeNZ High Performance squad members Tom Scully and Cameron Karwowski teamed up with Pieter Bulling and Hamish Tomlinson to form a killer combination that caught their rivals with five laps to go. In the under 17 boys 500m time trial there was a rare dead heat for third between Quinn Karwowski (Tasman) and Alex Hooper (Mid South Canterbury) in 35.415 seconds for third. Hometown rider Michael Culling won the event. The girls event was won by Kate Stewart (West Coast North Island). Southland completed a one-two in the final event of the night with Michael Culling winning the Under 17 Boys Points Race from Josh Haggerty while Jen Muhl survived the carnage in the Under 17 Girls Scratch race to claim bronze with Waikato-BOP's Robin Hacker-Cary taking the title. Tonight also provided the first chance for the Masters Men to stretch their legs with wins to Warrick Spence (Cat 1), Karry Harford (Cat 2) and Russell Scott (Cat 3) claiming Scratch Race wins.